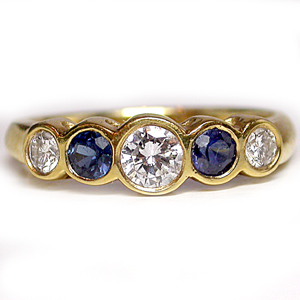 Two round sapphires alternate with three round diamonds in this lovely 18 karat yellow gold ring. The 3 diamonds total .40 carat and are graded F/G color-SI1/SI2 clarity, 2 sapphires total .40 carat. All stones are burnished-set into graduated bezels. Lustrous band is highly polished to a mirror-bright glow.